If you’re here, you’ve most likely heard enough about dental implants to pique your interest. If you have lost a tooth at some point in the past and want to replace it, dental implants should be on the list of procedures you’re considering. They are the tooth replacement that most closely approximates natural teeth. In the early 1950s, it was discovered that titanium implanted into living bone tissue would fuse, or osseointegrate, with the bone. Since that time, the medical and dental fields have taken advantage of this property, resulting in technologies like dental implants. you may not be a good candidate for dental implants. A consultation with one of our dentists will determine if dental implants are right for you. If not, don’t despair, we have plenty of other solutions that may be a better fit for your needs. There are several phases to this treatment. If dental implants are right for you, the first step will be the actual implantation surgery. This involves the placement of the titanium screw into your jawbone. 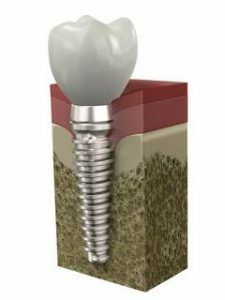 After this is done, it usually takes between four and six months for the implant to fuse with the bone and develop stability. Our teeth have to be able to stand up to a lot of use to serve us properly. When your dental implant is ready, a custom-made crown will be fabricated for you. This will then take the place of the lost tooth. Some patients may need to have more than one tooth replaced. Ask your dentist how to use dental implants for support of dentures, partials, bridges and multiple crowns. One reason that dental implants are so popular is that they can be used for so many applications when it comes to replacing teeth and regaining function and health. What are you waiting for? Call Buckhead Dental Partners today at (404) 261-0610 to learn more about how we can help you replace your lost teeth and regain function and esthetics. Having a full set of teeth can improve your life in ways you may not have even considered. Dr. Ballard look forward to seeing you!